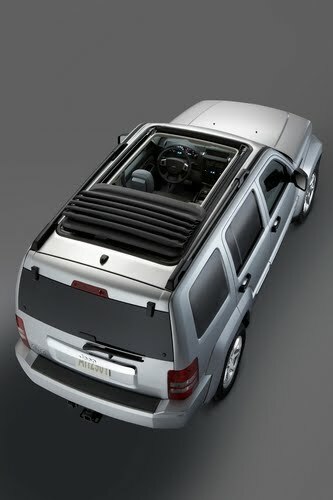 The Liberty that I drove, a Sport 4X4 with a "Sky Slider Full Open Roof." I have no idea how competent the Liberty might be off the beaten path. I was "Trail Rated" but I never put it to the test. I think you have to be a special type of person to appreciate the choppy ride every day. I am not that kind of person. I don't mind a stiff suspension but choppy/pitchy (not in the Randy Jackson way) just doesn't work for me. The 3.7-liter V6 was smooth but its 210 hp coupled with a 4-speed automatic transmission and 4WD was compromised by the Liberty's 4,290 lbs. If you love open air motoring, you will love the Sky Slider, a humongous fabric panel that slides back at the touch of a bottom to give enough open space for everyone inside to stand up and be half outside. The down side of such a semi-convertible roof is noise. There is no way a soft top is as quiet as a hardtop. All of this is available for an as tested price of $28,675.